Hey there my blog lovers! http://www.craft-mafia.blogspot.com/ to see what type of craftiness is going on across the country. Enjoy! It seems like every few weekends this summer the DC Craft Mafia will have members representing at various events all over the DMV (DC,MD,VA) area. This weekend Michael Auger of Arty4ever, Shayne Rioux of Novelty Kitten & Erica Burns of (you guessed it) Erica Burns Designs will be showcasing their art, jewelry & novelties at the Montgomery County Historical Society Heritage Weekend in Germantown, MD. Come on out & to enjoy the activities & stop by our tents! As part of this year's Montgomery County Heritage Weekend activities, MCHS will be hosting the first annual Fine Arts & Crafts Show at the Waters House. The show will feature craft artists from Montgomery County who create one-of-a-kind works in media that include painting, sculpture, cermics, glass, textiles, wood, and more. There will be live musical performances on both days of the show. A schedule of performers and a list of exhibitors will be available closer to the date. Turn LEFT onto OBSERVATION DR. Turn RIGHT onto AUTUMN ROSE WAY. Turn LEFT onto ROYAL CROWN DR. Enter next roundabout and take 1st exit onto MILESTONE MANOR LN. We know you have a MySpace page. Who doesn't at this point? My mother probably even has one! Stop by our page myspace.com/dccraftmafia and "friend" us. We'd love to see you on our space! DC Craft Mafia will be showing every second Saturday from June-October at the Ballston Arts & Crafts Market in Arlington, VA. Our first show will be this Saturday featuring Erica Burns Designs, Manatea Party & Novelty Kitten. Come see our latest crafty creations! 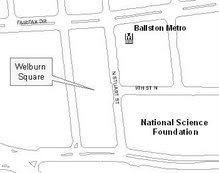 Ballston Arts + Crafts Market, second Saturday of every month, June through October, 10:00 a.m. to 4:00 p.m., in Welburn Square, across from Ballston Metro station and near Ballston Common Mall. June 9, July 14, August 11, September 8, October 13. Jewelry, pottery, photography, painting, fused glass, textiles and watercolors, as well as toys, fashion accessories, handpainted gifts and furniture. Live music at noon. Support for the Ballston Arts + Crafts Market is provided by Wells Real Estate Funds, The JBG Companies, and the Arlington Community Foundation. 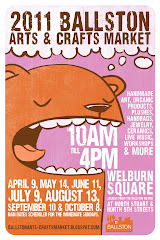 Check the Ballston Arts + Crafts Market blog for up-to-date information.